I am a very particular Banana Cream Pie eater and I tend to pass on most of the pies I see. I think it has something to do with their consistency and with my feeling as though the bananas are, somehow, lost in the cream and/or mushed beyond recognition. However, I was faced with a dilemma when I had 6 bananas sitting on my counter and did not want them to reach that dreaded ‘must make banana bread’ stage. Not that there is anything wrong with Banana Bread. Quite the contrary, I love it but did not feel like making it at the time. I decided to try my hand at a Banana Cream Pie and see if I could make one that would entice me to eat more than just a single bite. I chose to make a buttery pie crust but any 9” pie crust recipe would do, such as a chocolate wafer crust or a graham cracker crust. I know that the sugar in bananas can make a dessert a bit runny so I used bananas that were ripe and had not yet turned brown. I, also, chose to include mascarpone cheese because it would help stabilize the whipped cream. 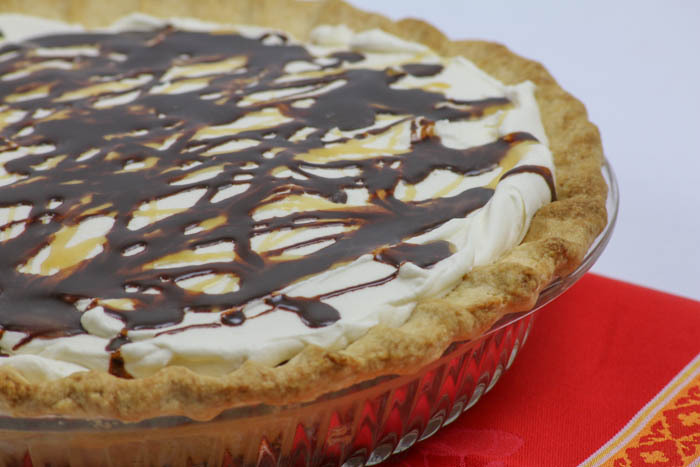 To really make this Banana Cream Pie tempt everyone, I brushed the bottom crust with melted chocolate. Besides preventing the crust from getting soggy, the chocolate added just the right ‘pop’ of flavor that Banana Cream Pie needed. 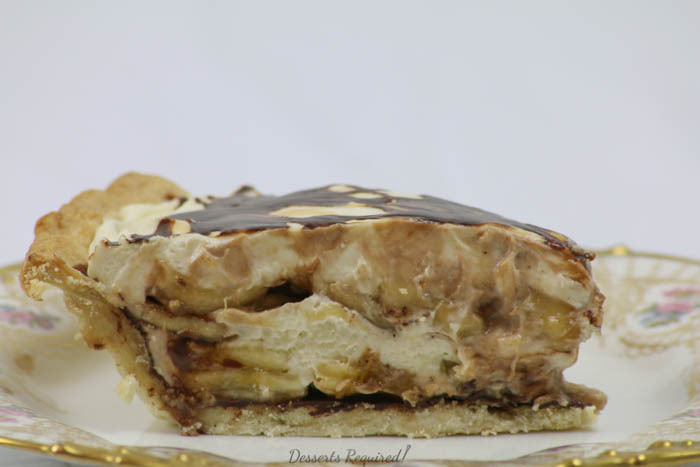 If all of the above does not sound tempting enough, add to that the fabulous drizzles of chocolate sauce and caramel sauce in between the layers of whipped cream and fresh bananas. You’ve got yourself one very special Banana Cream Pie. Please leave me a comment and let me know which crust you prefer with your Banana Cream Pie. Brush the melted chocolate over the pie crust. Refrigerate to set. Place the whipping cream, mascarpone, confectioners sugar and vanilla extract into a large mixing bowl. Beat on low speed until the ingredients are blended then increase to medium high speed. Beat until stiff peaks form. Set aside. Place a row of bananas over the crust. Top with half of the whipped cream. Drizzle chocolate and caramel sauce over the whipped cream. Place the remaining bananas over the whipped cream and top with the remaining whipped cream. Drizzle more chocolate and caramel sauce over the top. Keep refrigerated. The type of pie crust is a personal preference. A pastry crust, graham cracker crust or chocolate wafer crust would, all, work beautifully. Betsy – I adore banana cream pie, but I feel the same way you do. It has to be really special for me to eat it. This sounds divine, and I will make it some time soon. I’m working in Tallahassee all this week, so I can’t make it now!! I’m sure it will be delicious no matter which crust is used. BTW, New York Prime in Boca has a delicious banana cream pie! Thanks so much for your comments and the fab tip about New York Prime. This looks divine. 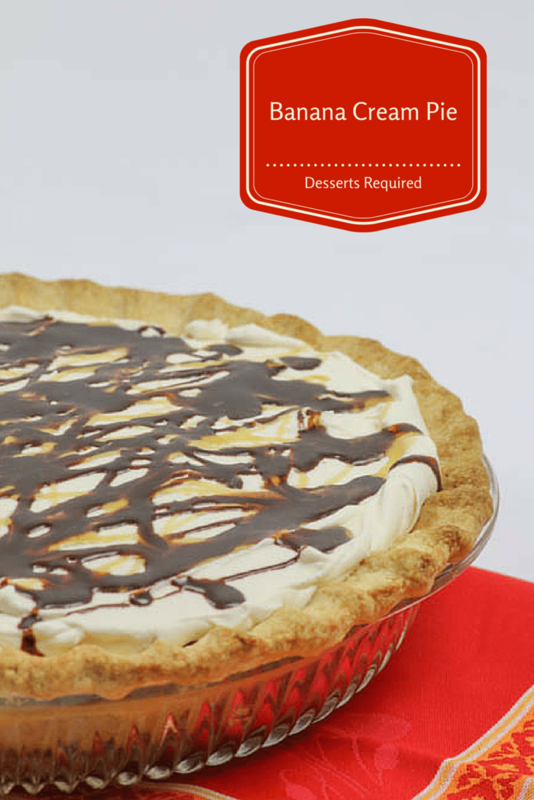 I have a couple of questions: 1) if I make it with a chocolate wafer crust, should I still include the melted chocolate layer; 2) if my memory serves me, correctly, you have a wonderful chocolate drizzle and caramel drizzle. Can you please tell me where I can find those recipes. Thanks for another great looking dessert. Definitely line the crust with chocolate if you make your Banana Cream Pie with a chocolate wafer crust. This helps prevent the crust from getting soggy. I wish that I could take credit for these drizzles. Unfortunately, I bought the sauces at the store. Sometimes is makes life SO easy! I made your divine Orange Creamsicle Cheesecake with the Shortbread Cookie Crust. How would that crust work with this and if it will work, can you please tell me what other ingredients to incorporate with it? And do I bake the crust first? Thank you. I think the Shortbread Cookie Crust would be wonderful with this Banana Cream Pie. I have not tried it but my inclination is to 1-1/2 times the recipe. I would bake the crust for 10 minutes just as you would do for the cheesecake. Please let me know if you like the combination. I think the orange zest will be delightful. Oh, I hadn’t thought of including the orange zest. Sounds great now that you mention it. Is this a pie that is best made the day before and kept in the ‘fridge overnight? You can make the pie the night before or the day you will be serving it. I do it both ways.